In June 2017 I joined two friends, Mark Bauer and Kip Walker, for a trek to Inuvik, NWT via Dawson City YT, the infamous "Dust-to-Dawson" this-is-not-a-rally, and the sometimes treacherous Dempster Highway. We made the trip successfully, but just dipped into Alaska briefly visiting Chicken, Tok and Haines AK. Once home, I realized I wanted to see much more of Alaska and began to think of where and when as well as how. At the time I owned two motorcycles, A Yamaha FJR Sport-Touring bike; a machine well suited for long journeys but not well suited for gravel or dirt. A Kawasaki KLR 650, the bike I had just ridden the 8,000 miles to Inuvik and back on. A bike admirably suited for the Gravel and Dirt roads but not well suited for the vast distances and speeds to get to where the Gravel and Dirt would be encountered. 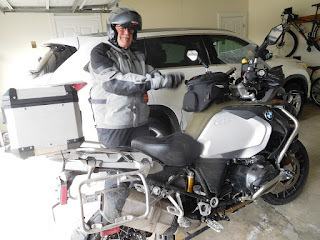 I decided to see who else in my FJR community might be interested in going with me, figuring that with the right tires, 50/50 or 80/20 Adventure tires, the FJR would make the trip OK. Both the ALCAN and Cassiar Highways are paved but one does encounter construction and repaving for long stretches along the way. After advertising my intent on several FJR Forums and on Facebook in late summer 2017 eventually, twenty-five folks claimed an interest in going along for the ride. In my heart I knew not all twenty-five would go, I expected about half to drop out as the trip became real and the requirement to commit money and time to the adventure became necessary. then enter Alaska via the Top-of-the-World Highway to Chicken AK. You can read all about what "Dust to Dawson is and is not by clicking on the following https://advrider.com/f/threads/2019-...sting.1359668/ and reading the first post. The TOTW Highway is not paved for a good portion of the way, it gets slippery when it gets wet, and, it is frequently wet. Some of the FJR folks decided they did not want to try the TOTW Highway and bowed out of the trip. Over the remainder of 2017 and throughout 2018 I found that I really enjoyed riding the Gravel and Forest Service roads on my KLR. Even after significantly improving my KLR with engine enhancements, a "Big Bore Kit" I knew I didn't want to make another 8,000 miles plus trip on the KLR. On my way back home from Daytona Beach in October 2018 I stopped to visit a friend in Missouri, we rode together the next morning for several hundred miles and swapped bikes. Skip had a BMW R1200GS, a bike I had not ridden before. 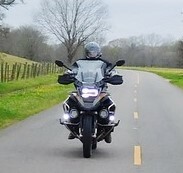 After 200 miles on Skips BMW, I knew I wanted one and recognized that the FJR and KLR would have to both go to get the BMW. The plus was that the BMW would do both long distance touring as well as handle all the dirt and gravel this 67-year-old needs to handle. I began to look for a bike and in December gound "Freya" a 2014 BMW R1200 GS Adventure Model. the Adventure model has a bit bigger gas tank, a little taller suspension, and a little bit more wind protection than the standard GS model bike. Freya came home in early December and the FJR and KLR both left my stable. Over Christmas and through January the UPS Truck was a frequent visitor as more and more "Farkles" piled up in the garage to make "Freya" exactly what I wanted for my ride. The number of participants having winnowed to a likely eight I booked a block of rooms at the Eldorado Hotel in Dawson City YT for the D2D event. Rooms fill fast during the event so I encouraged my fellow riders to book quickly, all did. June 13 - Eureka MT to Radium Hot Springs BC 3 hours(150 miles) or onto Banff Intentional short day to allow for late arrivals, repairs, maintenance etc. Shortens next days ride allowing more stopping and posy sniffing along Icefield Parkway, Lake Louise etc. June 14th – Banff/Radium Hot Springs to Grand Cache AB 6h 54 min (354 Miles) allows for sightseeing; Lake Louise, Icefields Parkway etc. June 22 - Dawson City to Fairbanks AK via Top of the World Highway and Chicken AK, TOK AK 185 Miles half gravel to Chicken then all paved to Tok and on to Fairbanks AK another 202 paved miles. Add another day in Denali? Add a day in Anchorage later on? June29/July 2 - Valdez to Haines Junction YT 10 h ) min (544 Miles) a Long day, but aside from Destruction Bay, not many other good places to stop. July2/July 5 - Watson Lake to Hyder AK. 9h 45 min (410 miles) Probably stay in Stewart BC at King Edward Hotel. July 8/12 - Helena to Spearfish via US 12/212. I just sold my Kawasaki 14 Concours and Buell Ulysses and bought a 2014 GS1200. My brother and I plan to ride to Tuktoyaktuk from Edmonton in June. Maybe our paths will cross in Dawson.